This exceptional model identifies its owners as real connoisseurs who do not waste their precious time on an ordinary wristwatch. The moon phase is not simply a technical display, it also appeals to the emotional dimension associated with the Earth's satellite. Its physical influences on our planet have been demonstrated, and its different phases are sometimes believed to affect our daily lives. Some people make decisions depending on whether the moon is new, full, waxing or waning. But unfortunately, the moon is rarely visible during the day. 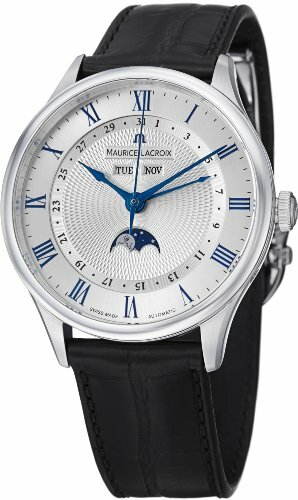 Maurice Lacroix addressed this problem in the 1980s by pioneering moon phase indication at a time when mechanical watches were regaining popularity. In addition to 2/13 displaying the moon phase at 6 o'clock, this wonderful model also shows the day of the week and the month at 12 o'clock, while a central hand indicates the date. The precision of the displays is ensured by the caliber ML 37, a superb rhodium-coated automatic movement. Its circular graining and Côtes de Genève decoration is visible through the sapphire case back, as is the oscillating weight, also decorated with Côtes de Genève.